Sure you’ve heard of a Haunted House, park or trail, but what about a haunted yard? As you drive through this Northlake neighborhood, past the fog, and into the flashing lights, you will stumble upon a yard that will surely stop you dead in your tracks. Unlike many of the yards that are out there, not only will you be able to admire this Halloween display but you can actually walk through this haunted yard where you will see, feel, and hear the sights and sounds of Halloween. 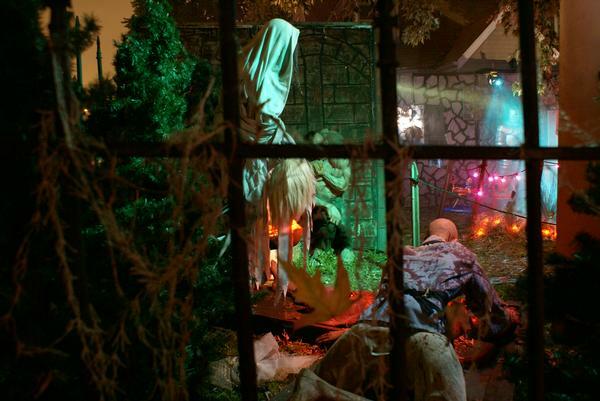 What started out as a family’s love for Halloween over ten years ago, turned out to be a yard filled with over 100 decorations and animatronics including an eight-foot demon, clowns, ghosts, and witches. Although there is no entrance fee, donations are encouraged and everything that is donated is donated to a non-profit organization. So if you are wondering where to take the kids this year and you are on a budget, this is one home that you will give you plenty of tricks and treats. Once the sun sets this Hallows Eve, make sure to head out to the haunted yard where thousands of brave souls such as yourself will make their way through the Village Haunt. After surviving the yard, make sure to check out their store where you can enjoy a hot cup of cocoa , cotton candy, get an airbrushed tattoo, or purchase some ghostly reminders for next year.